The local sources of Ahwaz Human Rights Organisation (AHRO) reported that the mass arrests in Ahwaz city and other cities in Khuzestan province, southwest of Iran, continued and more than 600 Ahwazi Arabs were detained, until this report of 30 Oct 2018. The people that were detained included political and cultural activists as well as a number of women and ordinary citizens. 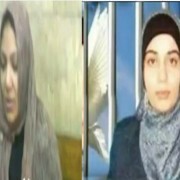 At the end of the article the names of some of the detainees are mentioned, most of whom are from Ahwaz, Muhammarah (Khoramshahr), Abadan, Falahiya (Shadegan), Khafajiah (Susangerd). The authorities of the Islamic Republic of Iran , through arbitrary arrests are attempting to exploit the armed attack on the parade of the armed forces in Ahwaz which took place on September 22th of this year and justify the suppression of Arab citizens in Iran. This widespread wave of arrests occurs despite the fact that IS claimed the responsibility for the attack. While the authorities admitted in 24 September 2018 that 22 people were arrested for alleged links to the perpetrators, local activists and sources confirmed that the number of detainees has exceeded 600 in the past two months including women, activists, intellectuals and ordinary citizens. While the details of the attack which the terrorist organization” IS ( Daesh)” has claimed responsibility for, and those behind it remain unclear, there is a growing skepticism about the involvement of the government, especially the IRGC intelligence apparatus, in complicity in this attack for political reasons related to internal and external crises. Read it again, this is quite unclear. The authorities have been carrying out a massive campaign of intimidation in the province of Ahwaz, which has been witnessed since the beginning of this year following the peaceful protests in Ahwaz and all over Iran. Protests were focused on pressing demands such as expensive and scarce drinking water, unemployment, dust storms, the spread of pollution and the transfer of water out of region. 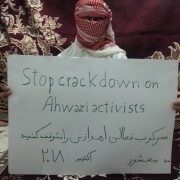 The Ahwaz Human Rights Organisation (AHRO) while reaffirming its condemnation of all forms of violence and terrorism, reiterates its firm position of principle of peaceful and democratic activity, strongly condemns the systematic state terrorism practiced by the Iranian government against the Ahwazi people and all peoples in Iran. The Iranian government attempts to link every internal movement with foreign conspiracies in order to justify repression and escape from the entitlements of the masses demanding their rights, which includes stopping government spendings on regional wars and expansionist ambitions and the protection of their rights to freedom and decent living. 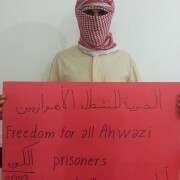 On the background of such a situation the Ahwaz Human Rights Organisation (AHRO) , while condemning the repressive practices and arrests carried out by the Iranian authorities, declares that it stands by the Arab Ahwazi detainees and warns against the consequences of torturing them to earn forced confessions, as the Iranian security services have always practiced. 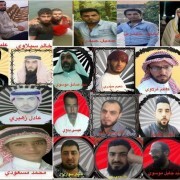 Ahwaz Human Rights Organisation (AHRO) calls for an immediate and unconditional release of detainees. Moreover, it warns against potential physical and mental torture to obtain compulsory confessions from detainees.